I would be the first to admit that it is so easy to just go to the grocery store, get all of your stuff and call it a day. Unfortunately, when you are trying to get wheat free products at a reasonable price, this method usually means you pay a premium. Today I'm going to share a couple of tips for getting the more pricy wheat free products at a better price. We are dominated by Publix down here in Lakeland, but we do have other grocery store options. It often takes a little hunting to find the gluten/wheat free sections of the grocery stores but almost all of them have at least a small selection at this point even if the people working there are not aware of it (Every single Publix down here has theirs in a different spot... including the frozen juice section so don't give up looking!). These stores may carry different brands and they may have slightly different prices on the same products. If you spend some time visiting different stores near you, you'll quickly figure out which store tends to have the best prices for what you are looking for. 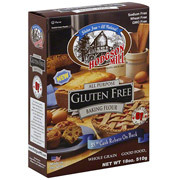 This was the first all purpose gluten free flour I tried and everything I made with it made me gag. This is because it has garbanzo bean flour in it which I apparently have a severe aversion to. 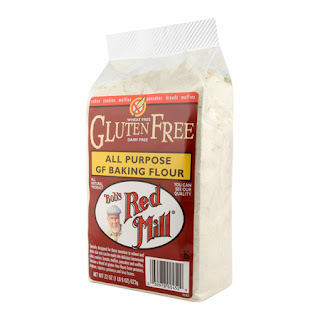 After that experience I didn't buy gluten free flour for a really long time. 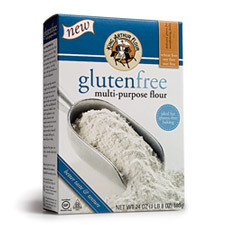 Then I found King Arthur's Gluten Free Flour and since I love the rest of their products (and no garbanzo bean flour was listed) I decided to give it a try. I was skeptical since you tend to get what you pay for, but at basically half the price of King Arthur's GF flour, I decided to give it a shot. I was pleased to find out it was comparable to King Arthur's and my pocket book now doesn't scream every time I buy flour. Another area to try different brands is GF pasta (Nate makes fun of me because I tend to call all types of pasta spaghetti so I'm going to try to be really good and not do that). There are a bunch of different types of GF pasta including rice, corn and quinoa. In my opinion, corn pasta is the closest replacement to regular pasta and it is the cheapest but once again it's best to try try try! This may seem like a weird place to get food, but they have the 'Subscribe and Save' option on some products which ends up saving a good chunk of change. For example, I use a lot of GF Bisquick. I'm obsessed with this stuff but once again, it's pricy at a little over $6 for a 16 oz box. I have a Prime membership at Amazon so I have free shipping so I don't have to worry about that. Even without subscribe and save, Amazon knocks the price down from $18.84 for 3 boxes to $14.64 and with subscribe and save it is lowered to $12.44 for 3 boxes or a total savings of $2.13 a box. The way subscribe and save works is that you sign up to have your product shipped to you in regular intervals. You can choose how often they are sent anywhere from 1 to 6 months. It's pretty convient to have your stuff just show up at your door every few months with the added bonus of a few extra dollars in your pocket. So far I have only used Amazon for dry goods, but they do sell things like Udi's products. Alright, I am officially out of tips! I hope you've enjoyed this mini series and hopefully you've learned a couple of new ways to reduce your wheat free budget. P.S. I wasn't paid or compensated in any way for the products I wrote about. These are the products I actually use and I find it easier to explain through examples. Thanks for all the tips- I had to go gluten-free almost a year ago because of constant migraines. What brand of pasta do you use? I've tried one and it was awful, haven't given any other a try. I bought a bread machine at a thrift store (looked like it had never been used) and made my own bread for the first time a couple of weeks ago- it was actually ok even though I bought the wrong kind of yeast. I think it'll be much better next time with the quick rise yeast, and so easy in the machine. I really like Sam Mills corn pasta. It has the closest texture and taste to regular pasta. This is also the only brand my husband will eat and he's super picky with the gluten free foods. Great tips! I learned some of these the hard way also. I feel the SAME WAY you do about Bob's Red Mill flour! Here's my secret--I use Pamela's baking mix for flour sometimes. It is pricey, but a bit cheaper in volume on Amazon. (I'm a Prime Member too. Very worth it.) I'm a new follower. Found you via Creative Me. Thanks for the tip on Pamela's. I've been meaning to try the mixes for awhile but haven't yet! These are fantastic tips! I have only been gluten-free for a couple of months and all of the different types of flour are completely confusing! It has helped me most to hear from others what actually tastes good! I am looking forward to looking at your past posts!